Guest blog by Tony Kokkad. Tony helps people learn about CallHub, which is bridging the communication gap for political campaigns, nonprofits and advocacy groups across the world through its Voice and SMS cloud based services. If you’ve been struggling with decreased engagement on your email campaigns or social media posts, especially on Facebook, maybe it’s time you explored a new channel. A channel that is affordable and converts at higher rate. What about texting? Text messaging is light on your budget and strong on returns. A look at the statistics for SMS open and response rates clearly puts it above other forms of communication. You might be hesitant because people don’t really want to get automated messages from you. And you might not be able to send customized text messages to them and manage replies. How would you scale? What if you could, with the help of just a few volunteers. What we’re recommending is Peer to Peer texting by CallHub. We call it Collective Texting. 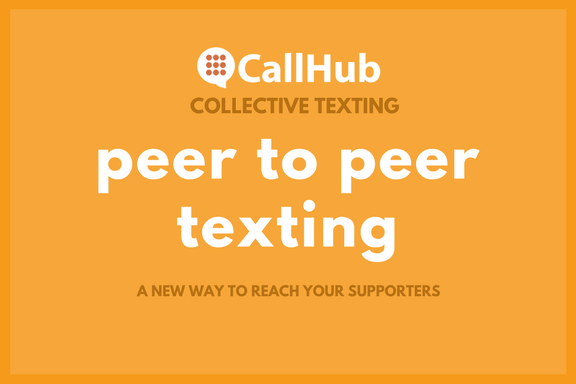 Peer to Peer texting is a new way to engage with your supporters, donors, and volunteers through conversational texts. How does it work? Each peer or volunteer in your team is assigned a list of contacts to converse with, using a peer to peer texting platform like Collective Texting. Through the tool they can text contacts, ask them questions and fill up surveys based on those responses, like if they will attend an event, or how much they are willing to donate. As the manager, you can assign and reassign conversations to volunteers, manage the campaign schedule, and analyse your campaign after. How is it different from text broadcast? Well for one, the replies aren’t automated. As the responsibility is divided amongst volunteers, each reply is sent manually. You could create suggested replies based on situations and volunteers can use them in their replies. Secondly, it’s as fast as text broadcasting and doesn’t break TCPA rules. Every text sent through Peer to Peer Texting is manually sent by a volunteer. This helps keep it within regulations while still being efficient as the load is divided between volunteers. Thirdly, every text sent is sent from the same caller ID. It gives the recipient a unified view of your campaign and volunteers don’t lose their privacy by texting from their personal numbers. Fourthly, by combining Tags with surveys, to a Collective Texting campaign, you can have surveys organically answered via text and the information syncs with your CRM. No more time wasted importing and exporting information from paper, disconnected systems, or numerous sources. Where is it the most useful? Potential donors don’t like to feel as though they are part of a campaign. A personal connection or contact with someone from your team will make them more responsive to your requests for support. Collective texting your donors informing them on the progress your organization has made and the importance of their continued support will have the required personal touch without losing out on efficiency. If you’d like to get supporters to act quickly, texting is the way to go. It lets you send a message directly to the phones of your supporters and with an open rate of 98%, you’re certain it will be read within 10 minutes. Volunteers can share quick information through texts and manage queries quickly. For a rally or event, if you’d like to get your supporters gathered together quickly, Collective Texting is the way to go. Voters who are older than 50 and those who are younger than 25 don’t respond well to email campaigns. They are more connected through their phones. For GOTV or voter identification, try texting to engage with your voters. Voters will find it less intrusive than a call, volunteers will find it easier than calling as it doesn’t require one to talk to a stranger, and response times are quicker than email. If you’re a Databank customer, you’re in luck, as it integrates with Collective Texting to make it easy to sync with supporters and donors in your CRM. You can decide who the recipients are, import them from your Databank account and use tags to sync activity and survey responses with your Databank CRM. We’ve worked on guides that will help you understand how Collective Texting can impact your campaigns, check them out at: Collective Texting Guides.